The Superbit™ Collection will set a new benchmark in high resolution DVD picture and sound, creating the ultimate in home entertainment. Superbit™ lets you use your existing DVD player to its maximum capacity! Superbit™ DVDs utilize a special high bit rate digital transfer process that optimizes video quality and offers a choice of both DTS and 5.1 Dolby Digital audio. All Superbit™ DVDs start with high definition masters and double the bit rate of the original release. DVD: Widescreen 2.35:1/16x9; audio English Dolby Digital 5.1 & DTS 5.1; subtitles English, Spanish, French, Portuguese, Chinese, Thai; closed-captioned; single sided - double layered; 28 chapters; rated PG-13; 126 min. ; $27.96; street date 10/9/01. Really, I found very little to dislike about The Fifth Element. Before I screened the DVD for this review, I hadn’t seen the flick in a few years, but I enjoyed it just as much now as I did in the past. In addition, I had to watch Element twice within a short period of time; I checked out the original DVD not long before I viewed this new release. I expected to feel bored and want to skip large chunks; after all, I’ve seen the movie five or six times, and with the last examination being so recent I didn’t think I’d be very entertained. I went through the same process with the original and the Superbit releases of Air Force One and wasn’t too excited the second time. 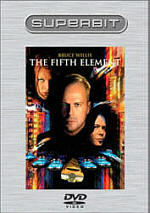 The Fifth Element appears in an aspect ratio of approximately 2.35:1 on this single-sided, dual-layered DVD; the image has been enhanced for 16X9 televisions. This disc represents the second DVD release of Element. The original came out almost four years ago, back when the format hadn’t even celebrated its first birthday. It crammed both fullscreen and widescreen versions of the movie onto one double-sided disc, but somehow it still managed to offer very satisfying picture and sound. However, apparently the good folks at Columbia-Tristar (CTS) thought they could improve upon this presentation. As such, Element - as well as some other films - has been reissued as part of their “Superbit” collection. According to the booklet that accompanied the DVD, this line offers “the highest standard for picture and sound available on DVD” with “higher bit rate for better picture resolution than standard DVD”. Those are some lofty goals - will the DVDs reach them? After all, Element already looked very good. Indeed, many have long regarded it as one of the format’s true “demo discs”. I recently rewatched it in preparation for this review, and I thought that though it’s not still one of the absolute best, it remains very solid. As such, it was going to be difficult for the Superbit version of The Fifth Element to improve upon the original DVD. Ultimately, I thought the Superbit release did provide a more solid viewing experience, but not by a tremendous amount. Thanks to the magic of cutting and pasting, the comments above almost exactly replicated what I said about the original DVD of Element. The only alteration I made was to omit a remark about some minor moiré effects visible in the old disc; the new one lacked any signs of such shimmering. Otherwise, my text remained the same. So why did I feel that the Superbit disc deserved the minor jump from an “A-“ to an “A” for picture quality? This was due to intangibles, honestly. I can’t say that “scene ‘X’ looked seven percent sharper on the new DVD” or any other statistical nonsense; I simply felt that the new disc provided a tighter presentation. Though terrific on the old release, colors looked a little more vibrant, and the entire image seemed more three-dimensional across the board. It was a smoother appearance that more closely approached the ever-elusive ideal of a “film-like” presentation. I liked the picture of the original disc and thought it looked very good, but I was truly dazzled by much of what I saw on the Superbit DVD. Were it not for some of the niggling flaws that carried over from the old one - since this appeared to be the same transfer - the Superbit Element would have earned an “A+”, whereas I never felt that strongly about the 1997 release. Remember that little booklet I stated the DVD included to explain the Superbit line? It provided a little graphic that compared the space distribution on a “standard” DVD and on a Superbit disc. Interestingly, we see that though the picture area jumped way up, the amount allowed for sound actually decreased. It was a slight drop, and I doubt that this simple image totally explains the distribution for all of the discs, but it was a telling sight. Even though the Superbit discs add DTS 5.1 sound to their original Dolby Digital 5.1 tracks, they get less space in which to make it work. How did this translate to the actual auditory experience of The Fifth Element? With a mix that seemed very similar to the one heard on the old Element DVD. As befits a big action/sci-fi flick such as this, the soundfield provided an extremely active and engaging setting. All five channels received a solid workout, but the track never seemed to offer any gratuitous audio; the various elements existed to create a vivid and engrossing whole. Music showed fine stereo separation across the front speakers and also cropped up with good support from the rear. Once again, cutting and pasting was my friend, for the comments above duplicated what I wrote in my review of the original DVD. They offered an exact replication, actually, with no small alterations akin to those found in my updated remarks about the picture quality. I won’t deny that there may have been some differences between the audio heard on the new DVD and on the original, but the two sounded identical to me. All of the same highs and lows appeared, and that included the minor distortion; those elements seemed to be part of the source material, and no new DVD format or anything else will change that. Another area of consistency related to the extras found on the DVDs. The old one offered virtually no extras, and the Superbit DVD maintained the same lack of supplements. The only difference stemmed from the DVD’s booklet. The original had a small piece that included a short blurb about the flick, some laudatory one-liners from critics, and a few photos; it was nothing special, to say the least, but oddly it failed to make the cut here. Instead, the package tossed in a simple one-sheet with chapter listings and a single shot of the cover art. Note that the Superbit Element also lacked any kind of interesting animation or pictures in its menus. Frankly, this seemed weird as well. The original disc just had a still photo of the cover art as the main menu’s backdrop; would it have taken all that much disc space to include it again? And was there not room enough to list little text identifiers for the various chapters in the “Scene Selections” menu? Whereas the old one provided comments like “On a Ledge” and “Art Dealer”, this one just lists numbers. Granted, the DVD’s insert card gives us descriptions, but these would be much more convenient on the disc itself. They still found the room for animated CTS and Superbit introductions at the start of the disc, and the DTS trailer also appears before the start of the film if that mode is selected, so it’s not like this DVD dropped all of these sorts of things. One note about the DVD’s packaging: The Fifth Element comes in a nice silver-colored slipcase that prominently features the “Superbit” logo. However, the art provided on the case itself almost exactly reproduced that of the original DVD. The front cover looked identical, while the back differed only because of the alteration of features and specs, plus it lost the UPC, since that’s on the slipcase. The spines also differ; the old one had some small pictures, whereas the new package just lists the movie’s name. It seems odd that they barely altered the artwork; I guess they figure no copies will be on shelves without the slipcase. If you do see Element on its own, you may want to check the back to ensure you find the version you want; some stores that sell used DVDs may lack the slipcase, so this would be the easiest way to verify the version you get. After four years and a bunch of screenings, I continue to find The Fifth Element to provide a funny, exciting and lively experience. The movie packed in more inventiveness than 10 standard flicks combined, and it did so with flair, panache, and class. The DVD offered almost flawless picture plus an excellent soundtrack, but it lacked any extras. In regard to my recommendation, I run into some trouble. Objectively, the Superbit edition of The Fifth Element surpasses the old one, as it offers a stronger visual presentation. If I didn’t own a copy and I wanted one, I’d prefer to have the Superbit version. However, that release lists for $8 more than does original, and the latter will be more easily available through used DVD outlets, which could also save folks some money. Is the Superbit version worth the extra bucks? For those who want the absolute best, yes, but otherwise, I think the two are similar enough to not warrant additional expenditure. The situation becomes more complicated for current owners of the old DVD. Would I want to spend an extra $25 or so to get this new disc? Probably not, for the differences remain so minor. Nonetheless, those who desire the strongest visual presentation of the film will have to consider it. The Superbit edition of The Fifth Element doesn’t blow away the old one, but the improvements exist, and they make it the best version of the movie available.